As of today, there are well over a billion people online. Here in the United States it has been reported that 99% of all English speaking Search Engine queries occur on Google, Yahoo, MSN, AOL, Ask and/or websites powered by these search companies. Furthermore, a staggering 89% of people search only on the major Search Engine companies. This is good news because it will help you streamline your focus on just a few Search Engines. Pay Per Click (PPC) has an average cost per acquisition of $8.50, which makes Internet Search PPC one of the most efficient ways to acquire new people. However, only 27.7% of Google users will click on a sponsored PPC link. Therefore, 72.3% of Google’s users choose a natural Search Engine Optimization (SEO) result rather than a PPC result. Yahoo and MSN report 60.5% of their users choose a natural (SEO) result rather than a PPC result. An increase of 15% for a sponsored PPC link is realized when PPC is complemented with natural results for the same Web site. Therefore, PPC should play a role in your online marketing strategy but focus most of your attention on SEO. 1. Use PPC as a temporary solution as your SEO ramps up. 2. Use PPC for short-term campaigns, events, disaster relief, etc. 3. Use PPC in order to conduct rapid mass-market testing, such as in the case of determining your organization’s strongest fundraising offers. 4. Use PPC in the case of time sensitive information, such as in the case of advocacy, mobilizing constituents, pending legislation, etc. 5. Use PPC during the last quarter of the calendar year, when people are most generous. 6. Use PPC to help boost your Web site in Search Engine Rankings. Now you may be asking, what you can do in regards to SEO. Well Google has an extremely complex algorithm to determine search results . . . who’s first, second, third, etc. However, Google works a little like this . . . it bases 80% of your Web site’s ranking on the number of links from other Web sites that link to yours. Now half of these links must be from “Authority Web sites,” such as directories, trusted sites, media, press releases, etc. The other half may come from topical links (non-reciprocal links from topically relevant Web sites. So you can see getting people to put your organization’s URL on their Web site is the key to blostering your rankings in the top Search Engines. 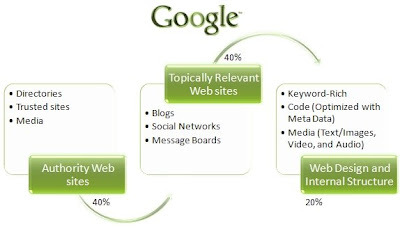 The remaining 20% of Google's algorithm is based on your own Web site content, in relation to your key-word strategy, design and internal structure. For example; 1) Your organization's domain name and how long it is registered for as a legal domain. Google allows for a maximum of ten years so ensure your domain name is register for at least ten years. 2) How often you update your site with new key-word rich content. What you say about who you are is very important to search engines as they attempt to catalog and rank your organization. 3) Is your Web site's structure Keyword-rich and "Spiderable?" 4) Is your Web site's code optimized with Meta Data? 5) Are you using Alt Tags to describe your images? 6) Are you syndicating content through RSS and link to us pages? 7) Do you include interlinking pages within your Web site? 8) Do you have inbound links from relevant Web sites? 9) Have you submitted your Web site and Site Map to search enginges? 10) Have you tagged other media on your site, such as audio and video? 11) Is your social media strategy fully developed with your keyword efforts as well as allowing for user generated content? Facebook, Twitter and other social networking sites are being considered in search rankings. All of these efforts will help your Web site receive higher rankings. Furthermore, another way to increase your rankings is to apply for a Google Grant and they just may give you in-kind keyword adverstising. Keywords, Content and Links are really important to provide the greatest information and the best products and services to clients. The idea of adding Natural SEO to web copywriting efforts is to get more clicks. Search Engine Optimization is a practical way to get more traffic to website through Natural SEO on MSN, Google and yahoo. Influential copywriting tactic is a good way to promote in search engines. Our Search Engine Optimization(SEO) company have develop a huge reputation for provide the best and very Affordable SEO services in the entire world.